So, what’s happening with public transport in other regions? First up, Wellington, our current reigning champion in terms of per capita usage, and the only other city we have monthly data available for. The region did see growth this year but not a huge amount. Total ridership increased by 1.1% to 37.8 million trips. 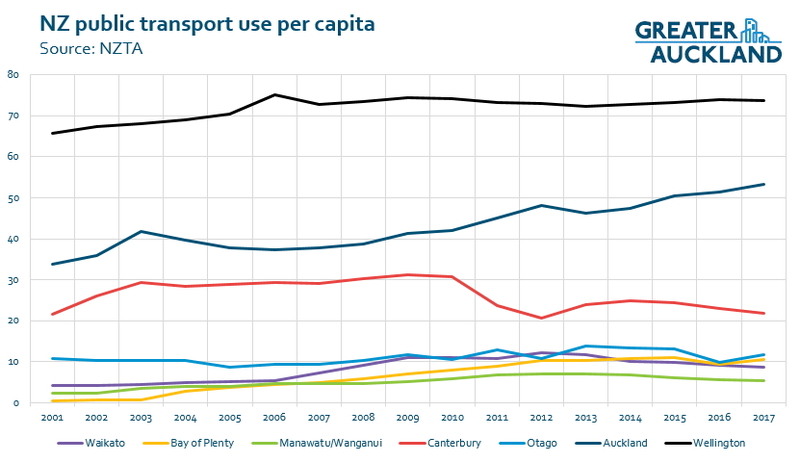 Like Auckland, the biggest increase came from the rail network which improved by 2.5% to a new high of 13.1 million trips (note: I only have data for Wellington back to 2000). 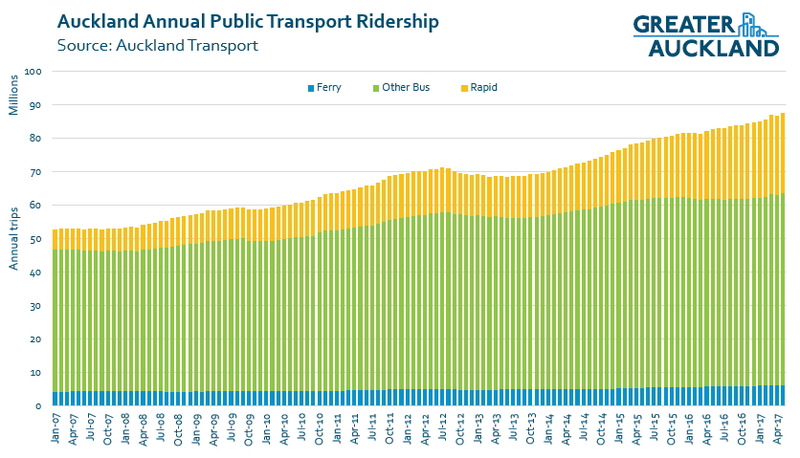 Bus usage also increased but only just, up 0.4% to 24.4 million. Outside of Auckland and Wellington, we need to rely on the NZTA for data and they’ve just updated their extremely useful online tool with the latest results. For the sake of legibility, I’m only going to show the results of regions with more than 1 million trips annually. 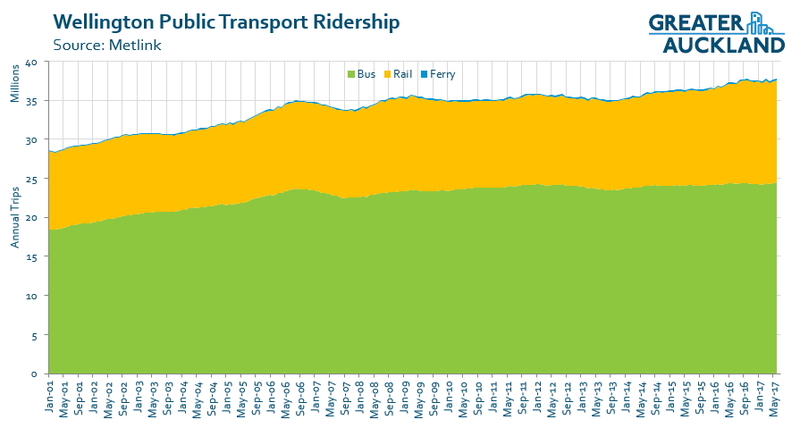 Ridership in Christchurch continues to struggle and is some way from returning to it pre-quake levels. Both the Bay of Plenty and Otago, which had seen decreases in 2016, increased once again. 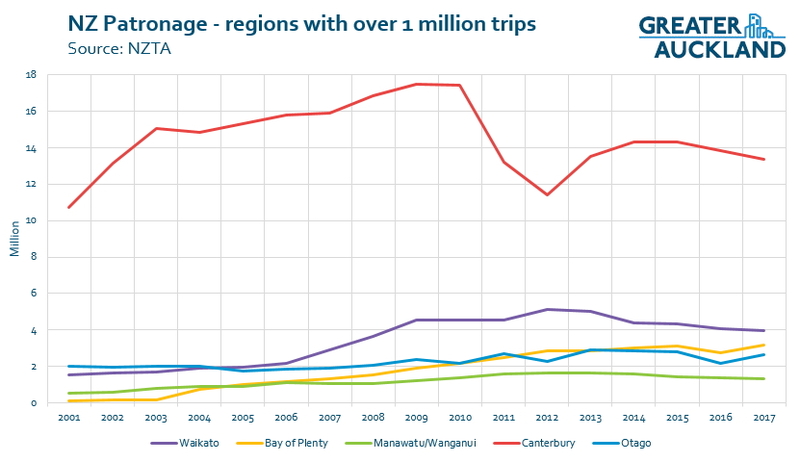 The BOP has also showing noticeable improvement over the years and if current trends continue, could surpass the Waikato for usage within the next few years. I don’t have the details for the previous years but of the BOPs 3.2 million trips, around 720k are for Rotorua. Most of the rest are for Tauranga with the exception of a few intra-regional trips. Similarly in Otago, the Wakatipu basin makes up just under 500k trips while the rest are in Dunedin. Wellington has continued to remain flat for the last decade or so, hovering around 74 trips per person. Auckland with its decent growth continues to close the gap but it could still take a decade to reach where Wellington is today. Mirroring the results above, Canterbury and Waikato have again seen declines while Otago is also declining at a per-capita level. The Bay of Plenty has bounced back up from last year but has been flat for the last six years suggesting the growth above is only a result of population increase. Overall, including Auckland and Wellington, there were 153.1 million PT trips in NZ last year, up from 146.9 million. That means Auckland now accounts for 58% of all PT trips in New Zealand while Wellington is around 25%. Interestingly Hamilton bus routes are being changed on September 30. I’ve only looked at my main route (the 09) but legibility has been significantly improved and the route has been extended 1 km to the interchange at the base. If the rest of the changes are similar this could really help ridership to grow. Ahh crap, I updated this year’s numbers but it appears some previous years have been restated. Both the Dunedin and Queenstown networks have been redesigned, with implementation in September/October this year, and broadly reflect the hub and spoke model seen in Auckland’s (watered down) new network. Will be interesting to see the redesigns’ impacts on subsequent patronage. Queenstown should be expected to grow, given fares will now be publicly subsidised (previously all commercial fares) to a flat fare of $2 with a smartcard. I thought it had happened last year in Queenstown? When I was there last year there was 15 min service between the airport and town, with buses from Kelvin Heights and Arrowtown terminating in Frankton for transfers. Yea they’ve had this for a while but it’s quite expensive ($12) because up till now government’s refused to subsidise it (I’m not sure if you can even call it “public” transport, it’s been a completely private, commercial operation). The new subsidised service begins in November, so will be interesting to see how much this affects next year’s patronage figures. Agree. However, there are two main constraints to bus use in Chch – a lack of good bus priority and very dispersed employment. The former can be changed with some paint and some balls by the council (doesn’t need government), the latter will hopefully improve in the next few years. Of course there is also a need for a rapid network using the rail corridor, but this would be a long game as there are many impediments on the existing network, much like Auckland in the 1990s. Chch is currently constructing bus priority along Riccarton Rd, the busiest bus corridor in the city, long overdue. And it looks like the northern corridor across the Waimak river will get a High Occupancy Vehicle (HOV) lane. But all of this is “bus priority lite”; we could really do with a few separated rapid-transit busways a-la Akld’s Northern Busway. The other factor you have overlooked is that one of bus’s key competitors, cycling, has gotten a lot better in the past couple of years in Chch. We’re seeing some significant increases in biking numbers and not all of that is switching from cars. Haha I agree with the “bus priority lite” term. I’m really disappointed that bus priority keeps getting watered down to accommodate traffic and parking. It happened with Riccarton Rd and it happened with Victoria St too. And I don’t understand why the streets around the bus exchange were rebuilt with no bus priority- St Asaph St actually carries more buses than Riccarton Rd does and has no buslanes whatsoever. From what I’ve heard, I think you might be being optimistic thinking that the HOV lane on the Waimak bridge is a done deal, there’s still a bit of convincing that needs to happen there. And even if it does happen, it’s not even on a core public transport route anyway (although they could shift the current route I guess). I’d like to see the whole core PT network covered in bus-lanes /signal priority. I think this was stated as one of the benefits of the route consolidation in 2014, that by having fewer, busier routes it was easier to justify buslanes. If labour get in I’m hoping their $100m might be invested in getting more buslanes over the line, and not completely used up just on rail. Christchurch is a wasted opportunity. The council seems to lack vision and the city will return to last century car based sprawling. They should have redesign the rapid transit network. Unlike Auckland, Christchurch doesn’t have its own “AT” to manage all aspects of public transport (got rid of that in the ’80s). Much time and effort is wasted by squabbling between CCC and ECan over who is responsible for what. Are these Trips or Journeys?